Here’s something I believe: my wedding was the actual best wedding ever. The weather was beautiful, the scenery was gorgeous, there was lobster, and the toasts weren’t too long. My husband looked fantastic. The cake was incredible. But I don’t need or want you to agree that mine was the best. In fact, what I want is for you to think that your wedding, if you are married, was the actual best wedding ever. If you came to my wedding, then first of all, I hope you enjoyed it thoroughly! And I also hope that you thought to yourself, “this wedding sure is great, but…mine was better.“ Not everyone has had a wedding, but of course this isn’t really about weddings. It’s that I want us all to have the pleasure and private satisfaction of believing in our own specialness, and knowing that we wouldn’t change a thing about ourselves. 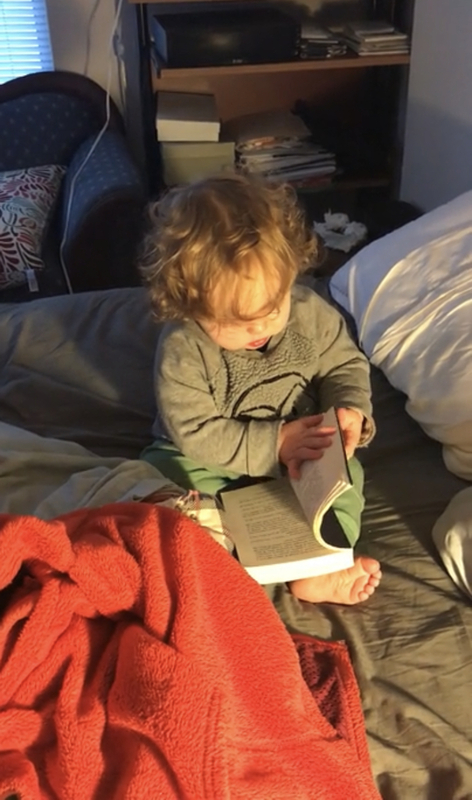 17 months old and she was already reading chapter books…IN SICILIAN. I think that those of us who are parents also feel this way about our children. Though I didn’t think I would, I am actually warming to other people’s kids considerably as Ros grows up; because of the cooperative day care she attends, I am regularly in her classroom playing with her and her friends, some of whom she and I have now known for well over two years. I grow more and more fond of them as they get older and smarter and funnier. And I feel quite an unexpected amount of tenderness and love towards my friends’ kids who are older and towards all the new babies that other friends are having. They feel like partly mine, in some ways, and I know I will love watching them grow up. But Ros is truly mine, and privately, I believe she’s special. I used to marvel at whatever new skill she was developing (buckling her buckle, opening her squeeze pouch, and especially the way, at one year old, she would say “Good night!” when we turned to the page in Good Night Gorilla with all the speech bubbles, as if she knew what they meant) and think to myself, “it’s not every kid that can do that like she does it!” Of course, I will be polite about whatever skill your kid has picked up that you’re super proud of, and I will pretend to be super impressed myself, but really, Ros’s skills are the only ones that really impress me. Her specialness doesn’t mean she’s above reproach, of course; she’s a human. I don’t intend to be the parent who thinks her kid can do no wrong. We can all feel that our kids are perfectly made without acting as though they are (or should be) perfect. “Perfectly made” is a phrase my run coach likes to use. We are all perfectly made, she says, which does not mean that we are perfect. It means that we do not need to be. With all our imperfections, we are, each of us, right where we need to be. Maybe we’re not where we want to be yet, and that’s okay, but we are not lesser because of our imperfections. We don’t actually need to change, any of us. And we all deserve to be loved for who we are. I want to love Ros for exactly who she is for the rest of our lives together - of course I do. So many parents share that sentiment, of course, and it seems as though unconditional love should be the default setting, but is it? Mom and Dad gets a lot of questions like the one above: how can I make my kid interested in this thing that I think is so important? My kid isn’t good at something that I think they should be good at - what should I do? I think that I gravitate towards this podcast because of the reassuringly consistent responses to questions like these: in so many words, stop worrying. Your kid is perfectly made. They’re not perfect, but they’re perfectly made, and your obsessing over this one thing will lead you nowhere good. I don’t feel myself striving too hard to mold Ros’s personality now, but she’s still so little that most of my energy goes towards defusing, de-escalating, and management of needs. Things are changing, though - the person she is becomes more apparent every day. Of course I have a vision of what kind of person she will be; we all, I think, imagine ourselves and our kids in the future - the relationship we’ll have, the interests we’ll share, and the ways we’ll show each other the world. I’ve always fantasized about the books I’ll read aloud to Ros and the movies I’ll watch with her. I’ve thought about us getting coffee together and running road races together, when she’s old enough for those things. I assume she’ll be an intellectual sort, like me, but her reading of Goodnight Gorilla doesn’t guarantee anything. No, she will be the one to decide which of my fantasies she’s interested in fulfilling, not me. Will I be able to hold myself back from trying to change her? I would like to think so, but how many times in my life have I tried to change myself, held myself to unattainable standards and found myself wanting? Acceptance and unconditional love require more intention and thought than many of us assume they do. Part of why I loved my wedding so much, now that I think about it, is that I didn’t really go into it with a fantasy to fulfill or a vision to realize. I knew how I hoped to feel, and how I hoped others would feel, and the choices we made in pursuit of those feelings turned out to be just the right ones. I told my parents after the fact that I could not possibly have imagined or planned or projected a better day, but it sure turned out just the way I didn’t even realize I wanted. Luck certainly played a part in that - we got perfect weather, for one thing, and we didn’t have a great fall-back plan in the event of rain. My stepmom, I learned a couple of years later, had actually bought all the umbrellas Wal-Mart happened to have in stock that weekend, just in case we needed them. And the venue - if I hadn’t been in exactly the right place at exactly the right time, I never even would have known about it. I don’t consider myself personally deserving of credit for how wonderful everything was; it just was. I love it because of all the serendipity involved in its coming to be. It was perfectly made. Ros is amazing, and she is not amazing because of me. She’s hilarious and empathetic and loves books. She sleeps great, she eats all the foods, and she seems to be (finally!) fully potty-trained. These are all things we hoped for! We tried to create conditions in our house that would enable these outcomes! But we are not the reason they happened; she is. I am lucky as every parent is lucky to have an amazing kid. My job, as I see it, is to guide her and help her, just as I learn about who she is and what she likes and what she values, whether I like and value those same things or not. With the onset of Disney princess obsession, my resolve in remembering what my job is will be tested, and I’m going to have to work hard at it sometimes. If I forget, I hope the reminders keep coming. If you need reminding, here you go: your kid is amazing. Full stop.